Eco-geological monitoring (a system of permanent observations) of natural, geological and anthropogenic changes is crucial for the sustainable development of mining areas and enterprises. At the same time, it is necessary to take into account the specific features of the impact of the anthropogenic system of the mining enterprise on the environment, the background state of the environment in the given territory, other available anthropogenic sources of this impact, the existing monitoring system, the composition of the pollutants, and the peculiarities of the natural conditions which determine the distribution and accumulation of pollutants. This paper proposes a methodological approach to eco-geological monitoring through development of a monitoring system in the zone of influence of mining enterprises. 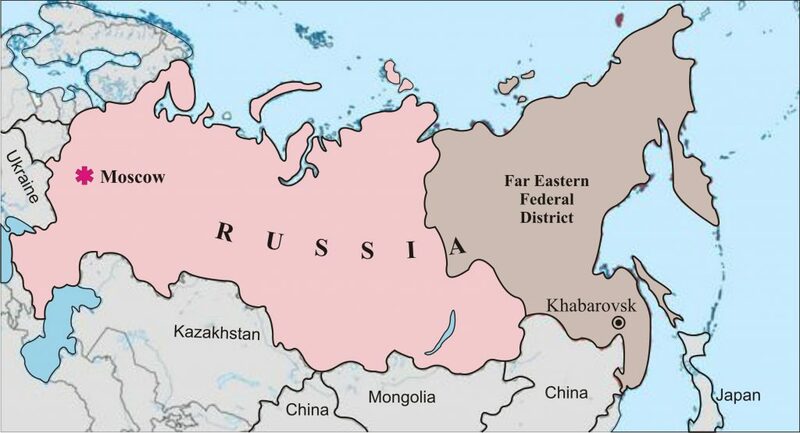 The Far Eastern Federal District is 6,215,900 square kilometres, 36.4% of the territory of Russia (Figure 1). The population of the region is 6,293,100 people (4.9% of the population of Russia). The centre of the Far East is Khabarovsk. Figure 1: Far Eastern Federal District on the map of Russia. The vast majority of the mining enterprises in this region were created more than 30 years ago. In recent years, the number of new discoveries has declined sharply, along with a reduction in geological exploration due to financial reasons. The process of augmenting the mineral resource base (MRB) has decreased. Some examples: diamond reserves decreased by 7% in 2016 compared to 2011, platinum by 18%, tin by 4%, etc. The mining industry in the region has suffered considerable damage (there was a reduction in production). A negative balance of stock (resources) has been noted in recent years (i.e. the stock has decreased): for placer gold, coal, copper, lead, zinc, nickel, cobalt, tin, antimony, boron ores, fluorspar, silver, platinum, etc. Now the region occupies a leading position in the country in geological prospecting and licensing. The mineral resources of the Far Eastern Federal District (DFO) predetermine the possibility of a significant increase in gross regional product (Sklyarova & Arkhipova, 2011). The main products of the mining industry of the Far Eastern region of Russia are fossil fuels (oil, gas, coal), precious metals (gold, silver, platinum) and precious stones (diamonds), nonferrous metals (tin, tungsten, lead, zinc) and nonmetallic minerals (boron, fluorite) (Figure 2). Figure 2: Some large deposits of the Far Eastern Federal District. Compiled by Arkhipov & Arkhipova. Currently, more than 50 companies work in the Far Eastern region or participate in the management and capital of enterprises involved in the development of ore deposits: Russian, Russian with shares of foreign capital, or joint ventures. The largest of them, as well as the deposits that they develop, the type of minerals and the regions of the Far Eastern Federal District, in which the deposits are being developed, are shown in Table 1. 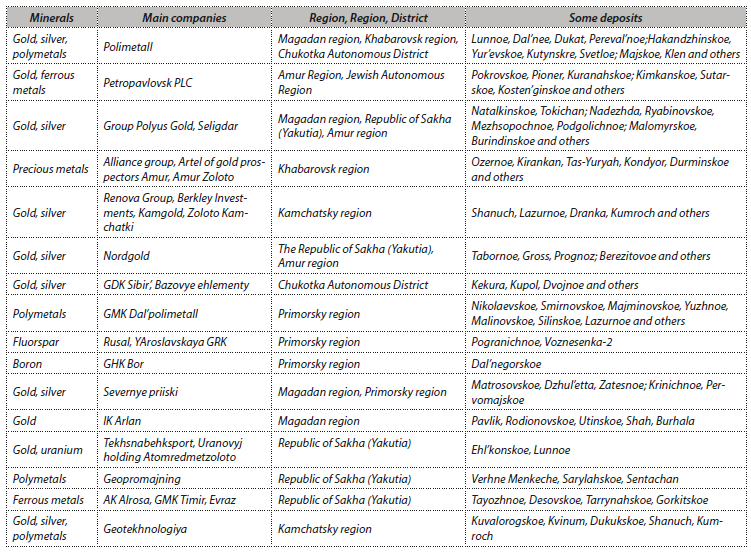 Table 1: Mineral Resources of the Far Eastern region of Russia. The table shows that trans-regional and large companies are the main exploiters in the (see Arkhipov, 2015, for a location map). Several corporations have also been created to manage the development of territories, with founders in the form of state authorities. However, the deposits are located on a territory of considerable size. The already acquired areas of activity of the largest companies are territorially more or less disconnected, which is natural for the mining industry in general, but especially for the Far Eastern region (see Figure 2). The mining companies listed above undoubtedly cause irreparable harm to the environment (Krupskaya et al., 2017). To improve the situation, a system of constant monitoring of the environmental situation within the mining territory is required, namely, environmental and geological monitoring. The object of eco-geological monitoring is the geological environment and the impact processes on the ecological environment of the surrounding nature. So, for example, the eco-geological monitoring of the Far Eastern region of Russia reflects the specific anthropogenic load on that territory. Monitoring of the state of the environment is carried out in accordance with the Resolution of the Government of the Russian Federation “About the Establishment of the Unified State System of Environmental Monitoring” of 24 November 1993. Environmental problems arising from the extraction of mineral raw materials are handled by the following authorities: Ministry of Natural Resources of the Russian Federation; State control service in the sphere of nature management and environmental safety; State Environmental Protection Service; Federal Service of Russia for Hydrometeorology and Environmental Monitoring and other services. In this relation, there is a need to create and develop a monitoring system in the zone of effect of the mining companies, to ensure environmental safety and a rational use of the natural resource potential, and to implement in practice the principles of sustainable development of the region. When organising such monitoring, the observation network should be aimed at monitoring surface water and groundwater (hydrodynamic regime and chemical composition of water); possible types of pollution of soils, vegetation and rocks; the aerosol component of the air environment; and the stability of the fronts of open-cast mines and tips. Priority of the sustainability of the development over maximum economic profit. In all environmental and geological monitoring, anthropogenic changes and damage to all natural and technical objects and the population in aggregate should be analysed. Ways and methods of practical implementation of the target complex program are related to the third principle, on the basis of which the program should have a scientific justification: the selection of specific areas and objects of the real and expected anthropogenic change in natural objects; the choice of a methodical monitoring system, the establishment of an observational network, the regime and the observation period, taking into account already existing regime observations. The spatial boundaries of the eco-geological monitoring and the location of the observation points of the fixed network are determined by the content of the tasks to be solved during the monitoring, the peculiarities of the natural situation, migration routes, and accumulation and removal of pollution from the anthropogenic object to the environment. 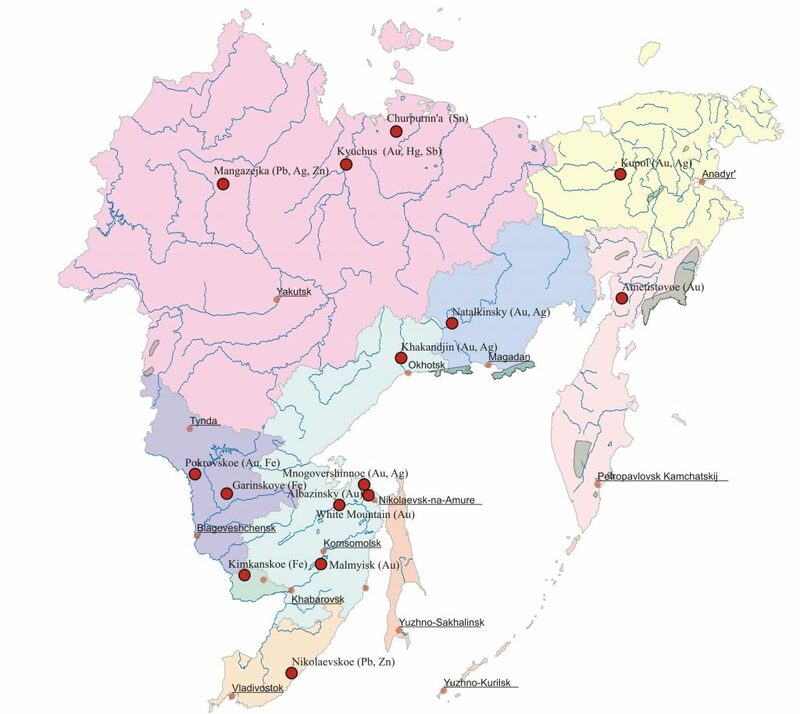 An example of the organisation of regional environmental monitoring in the south of the Far East is shown in Figure 3 (Saksin & Bubnova, 2007). 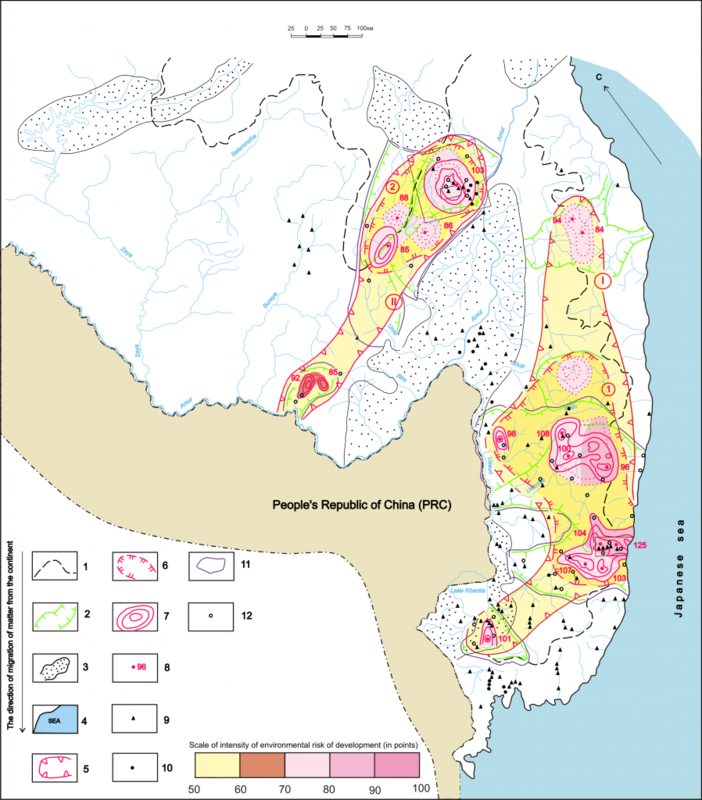 The ecology-forecast map of the regions of extraction of non-ferrous and rare metals in the southern part of the Far East was designed by Mining Institute FEB RAS. The regional natural-mining systems and the points of observation of the state of the surface water are marked on the map. Data of observation for the organisation of the first stage of regional environmental monitoring was collected by Roshydromet, the Ministry of Natural Resources of Russia and water users. Аccounting for the main natural factors of migration of heavy metals at the local level. Scores of the environmental risk of the development of these facilities. Figure 3: Ecological forecast map of the areas of extraction of nonferrous and rare metals in the southern part of the Far East of Russia. From Saksin & Bubnova (2007). 1-4 – The main elements of a generalised model for the migration of pollutants from the continent: 1 – regional watersheds that outline the catchment areas of the seas and trans-regional rivers; 2 – large river basins draining existing and possible natural and mining systems in the future; 3 – continental (intermediate) basins of accumulation; 4 – marine sedimentary basins. 5-8 – Regional natural and mining systems (projected): 5 – provinces (I – Primorskaya, II – Khingano-Badzhalskaya); 6 – areas (1 – Ussuri-Bikinskaya, 2 – Komsomolsko– Badzhalskaya); 7 – areas – the limiting position of the outer boundaries of the 1st, 2nd and 3rd contamination zones is shown as continuous, and the dotted line is their probable position after the development of the State working balances; 8 – maximum assessment (in points) of the environmental risk of developing the field in the circuit. 9-12 – Control over the development of regional pollution: 9-10 – observation points for surface water: 9 – Roshydromet, 10 – MNR of Russia and water users; 11-12 – objects of mining and environmental monitoring (recommended): 11 – contours of areas where it is necessary to organise regional mining and environmental monitoring; 12 – points of regional mining and environmental monitoring. Along with the regional natural and mining systems, the main elements of the generalized model of migration of pollutants from the continent are shown. This allows us to give scientific recommendations for the location of environmental monitoring points for monitoring the development of functioning regional natural and mining systems. When developing environmental-geological monitoring, the following tasks must be carried out: 1) justifying the rational placement of a network of monitoring points, based on the basin principle of migration of matter and energy from the continent; 2) determining the objects of testing and controlled parameters, linking the technology used to the mineralogical and geochemical features of the studied raw materials and the natural conditions of the formation of man-made flows; 3) determining the necessary frequency of testing various components of the natural environment; 4) justifying the types of analytical studies. As sampling objectives, it is recommended, to use soils in addition to surface waters as the main environmental targets that can hold various types of pollution and perform both a buffer and a detoxicant role, as well as bottom sediments, sediments of local watercourses formed in conditions of active water exchange, possessing high ability to accumulate many chemical toxic elements. The impact of toxic waste from mining enterprises on the ecosphere can be estimated and forecast also on the basis of modern information technologies that allow the processing and analysis of large amounts of diverse information (Potapov et al., 2005). The analysis of constantly updated spatial data obtained directly from mining enterprises is possible when creating an information system for environmental and geological monitoring, which consists of the regulated collection, storage and subsequent processing of a huge amount of heterogeneous information, including materials of remote sensing of the Earth (RSE) from outer space. Determination of meteorological characteristics, vertical temperature profiles, integral humidity characteristics, cloudiness, etc. Control of snow cover dynamics and snow cover contamination in the zones of influence of industrial enterprises. The monitoring system is based on the use of such data; therefore, its construction on the basis of GIS is justified, especially since the modern GIS is not only a means of processing of spatial data, but also a means of providing, developing and supporting the adoption of scientifically sound management decisions. The strategy of sustainable development provides for an assessment of the degree to which the ecological endurance of a certain territory corresponds to anthropogenic impact and predicts the consequences of human intervention in the biospheric circulation of matter and energy. Diagnosis of the state of the ecosphere is the establishment and study of the characteristics characterising the state of the ecosphere, to predict possible deviations and disturbances in their functioning. At the same time, vegetation is a reliable indicator of the state of ecosystems and the degree of their transformation as a result of some impact (Kapitza & Rice, 2003). Comparison of the results of remote sensing with field research data makes it possible to improve the accuracy of the studies carried out. In conclusion, the results of studies conducted on the example of mining enterprises of the Far Eastern region of Russia (carried out at some mining enterprises) have shown that a system of environmental and geological monitoring of the environment is the most rapid means of assessing the environmental impact of man-made activities in different natural conditions of the region Thus, it has been established that it is necessary to carry out monitoring that must take into account the specific features of the impact of the man-made system on the environment of the mining enterprise, the background state of the environment in the area, other available man-made sources of this influence, the existing monitoring system, the composition of pollutants and accumulation of pollutants. The use of remote sensing tools provides up-to-date, complete and reliable information on the degree of geological, hydrogeological, engineering-geological and ecological study of the area, and this, in combination with information from other sources and materials obtained under field conditions, is an effective mechanism for solving a wide range of both practical problems and theoretical studies. To improve the environmental situation, a methodological approach is proposed for the development of a monitoring system in the zone of influence of mining enterprises. Ways for practical realisation are offered to tackle the problem of minimising anthropogenic changes in the region. Arkhipov G.I. 2015. Territorial’no-korporativnaya organizaciya gornorudnoj promyshlennosti Dal’nego Vostoka. (Territorial-corporate organization of the mining industry of the Far East). Geografiya i prirodnye resursy 1: 135-141. Kapitza A.P., Rice G.U. 2003. Ehkologiya Severa. Distancionnye metody izucheniya narushennyh ehkosistem (Ecology of the North. Remote methods of studying disturbed ecosystems). Scientific World: Moscow. Krupskaya L.T., Zvereva V.A., Golubev D.A., Bubnova M.B., Tagirova V.T. 2017. Problems of Reducing Environmental Damage Caused in the Past Century by Mining Facilities and Ways of their solution in the Far Eastern Federal District. Russian Journal of General Chemistry, 87(13):3107–3114. Kudashev E.B., Filonov A.N. September 7-9, 2005. Environmental Monitoring Digital Library: Improving the accessibility of the Russian Satellite data. Proceedings of the 19th International conference EnviroInfo 2005 – Informatics for Environmental Protection. pp. 230-238. Potapov V.P., Mazikin V.P., Schastlivcev E.L., Vashlaeva N.Y. 2005. Geoehkologiya ugledobyvayushchih rajonov Kuzbassa (Geoecology of coal-mining regions of Kuzbass). Publishing house “Science”: Novosibirsk. Saksin B.G., Bubnova M.B. 2007. Monitoring prirodno-gornotekhnicheskih sistem regional’nogo urovnya – aktual’naya zadacha dlya territorij s syr’evym profilem ehkonomiki. (Monitoring of natural and mining systems at the regional level is an urgent task for territories with a raw material profile of the economy. Gornyj informacionno-analiticheskij byulleten’, 15: 205-213. Sklyarova G.F., Arkhipova YU.A. 2011. Prirodno-resursnyj potencial Dal’nevostochnogo ehkonomicheskogo regiona (DFO) (Natural and resource potential of the Far Eastern Economic Region (DFO)). Problemy kompleksnogo osvoeniya georesursov : materialy IV Vseros. nauch. konf. s uchastiem inostrannyh uchenyh (Problems of integrated development of geo-resources: Proceedings of the IV All-Russian Scientific Conference with participation of foreign scientists). Khabarovsk. Vol. 2, pp. 261-268.